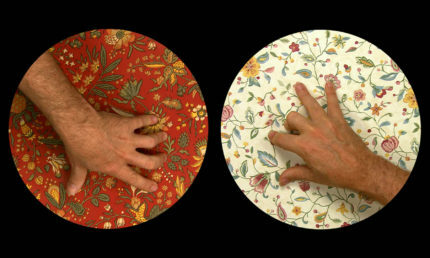 A text performed by the Australian poet-composer Chris Mann acts as a linguistic (im)pulse for a pair of hands minding two large discs, arranged side-by-side in a wide-format projection(s). 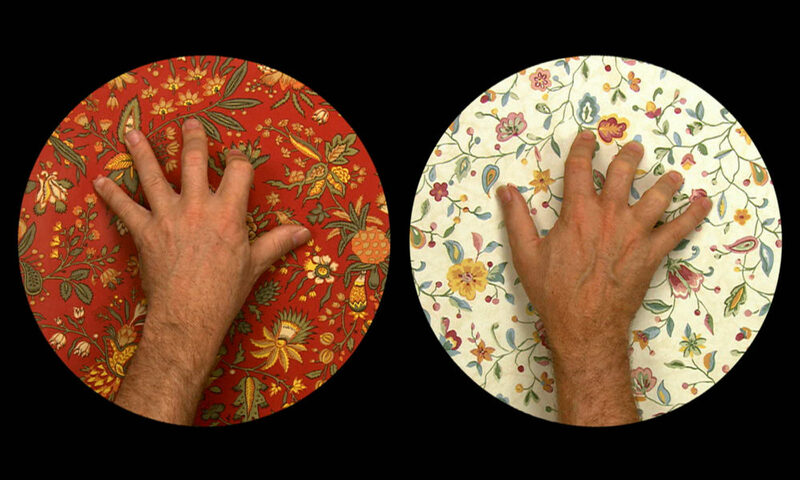 The circular shapes, covered with flowery decoratively patterned wallpaper, one red and one creamy white, spin bi-directionally at varying times in unison and independently. With radical pitch changes and sounding like multiple voices (electronically unaltered), the somewhat musical speech runs wild through a nonlinear array of subjects held together (and apart) by self-reflexive phrases and punctuation. The fingers move spider-like and decidedly over the moving surfaces, contorting as necessary so as to touch only the flowering buds amidst the curvy vines and stems. The movements of the fingers and discs and the rhythm and pitch of the voice become something of a physical/verbal dance, with the juxtaposition harboring something perhaps disturbing. An example of this work was first exhibited by Donald Young Gallery at Art 33 Basel, Basel, Switzerland, June 12 – 17, 2002. Note: First exhibition of single-channel version in HD format on a gas plasma screen. 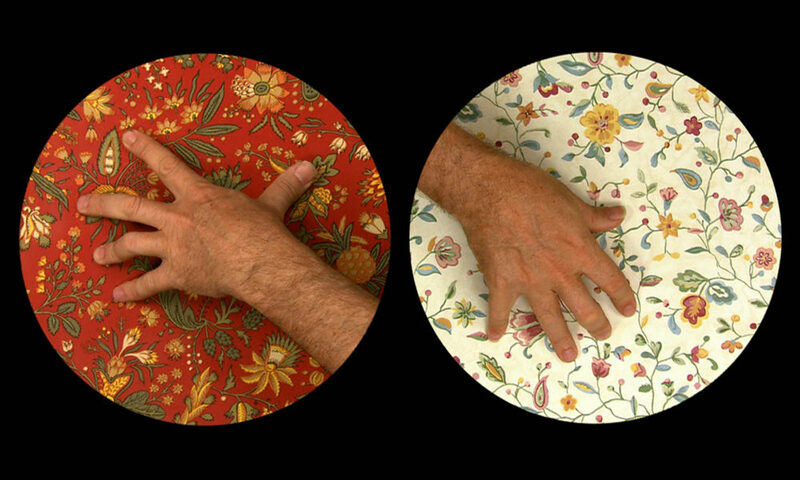 “Language Willing,” Barbara Gladstone Gallery, New York, New York, September 14 – October 19, 2002. Note: First exhibition of two-channel projection version in HD format. “Aubes, rêveries au bord de Victor Hugo,” Maison de Victor Hugo, Paris, France, October 10, 2002 – January 19, 2003. “Future Cinema,” ZKM / Center for Art and Media, Karlsruhe, Germany, November 16, 2002 – March 30, 2003; Museum of Contemporary Art Kiasma, Helsinki, Finland, June 28 – September 28, 2003, and ICC (NTT InterCommunication Center), Tokyo, Japan, December 12, 2003 – March 7, 2004. “OUTLOOK: International Art Exhibition, Athens 2003,” Athens, Greece, October 24, 2003 – January 25, 2004. 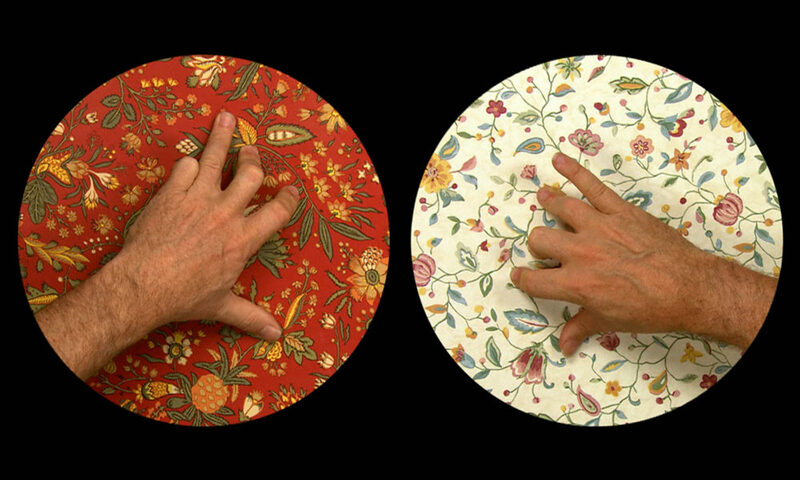 “Gary Hill: Language Willing,” 911 Media Arts Center, Seattle, Washington, December 2, 2004 – January 2005. Art 40 Basel / Donald Young Gallery, Basel, Switzerland, June 10 – 14, 2009. “Surface / Ground,” Young Projects, West Hollywood, CA, August 14 – September 15, 2010. Quasha, George. Gary Hill: Language Willing. Barrytown, NY: further/art and Boise: Boise Art Museum, 2002, pp. 7, 22 – 27, 30, 44. “Boise Art Museum begins “Genius” show.” SkyWest Magazine (Winter 2003), p. 27. Shaw, Jeffrey and Peter Weibel. Future Cinema: The Cinematic Imaginary after Film. Karlsruhe: ZKM and Cambridge: MIT Press, 2003, pp. 304 – 305, 622. Joachimides, Christos M., ed. OUTLOOK. (Athens: Hellenic Culture Organizations, 2003), pp. 166 – 167 (photos). Quasha, George and Charles Stein. An Art of Limina: Gary Hill’s Works and Writings. Barcelona: Ediciones Polígrafa, 2009, pp. 23, 353, 362 – 365, 371, 583. Ramos, María Elena. Gary Hill. Caracas: Centro Cultural Chacao, 2009 (in Spanish), pp. 8. Gary Hill: o lugar sem o tempo / taking time from place. Rio de Janeiro: Contra Capa Livraria / Mag Mais, 2009, pp. 14, 15, 30 – 45, 77 – 83. Gary Hill: Viewer. Moscow: GMG Gallery, 2010 (in Russian and English), pp. 18, 19, 48 – 49. Text written and performed by Australian poet-composer Chris Mann.